Blue Jays pitching coach, Pete Walker, joined Prime Time Sports on Sportsnet 590 the Fan to discuss several topics including Joe Biagini, as the Blue Jays approach spring training. In a week’s time, we’ll start to see the first footage of spring training, as pitchers and catchers begin reporting to Dunedin. Until then, we’re left with surfing Twitter for updates, and dreaming about the players currently on the 40 man. Fortunately for hungry Blue Jays fans, Pete Walker offered up some tidbits while visiting Sportsnet 590 the Fan on Tuesday, including more discussion around Joe Biagini as a potential starter. “He’s a kid that has certainly started in the past. He’s got a starter’s mentality”, said Walker. “He was exceptional out of the bullpen for us but certainly he’s got a starter’s build and repertoire moving forward”. Biagini became an unexpected key contributor the bullpen last season, finishing the season with a 3.06 ERA across 67.2 innings, all as a reliever. The 26 year old was plucked from the San Francisco Giants organization in the Rule 5 draft last offseason, and far exceeded expectations. 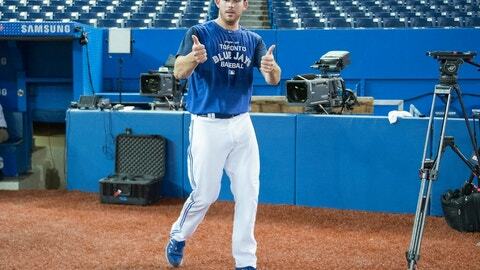 He earned the trust of manager, John Gibbons, and became a go-to, late inning arm, even during the playoffs. That’s a lot of value from a rookie the Jays were able to acquire for nothing. As we’ve heard several times this offseason, the club plans on stretching him out during spring training, regardless of his ultimate role. That mentality certainly makes sense, as there is no harm in preparing him early, in the event that a need arises. That’s where another key quote comes in. Walker has likely spelled out the situation for us, without actually stating anything directly. The club more than likely needs his services in the bullpen, even after the additions of J.P. Howell and Joe Smith last week. That said, for as productive and healthy as the Blue Jays’ rotation was last season, it’s hard to expect a repeat performance, especially in the durability department. The Blue Jays have added a lot of depth in the bullpen through minor league signings, but they haven’t addressed the rotation in quite the same way. They do have Mike Bolsinger and possibly Gavin Floyd as candidates, but the options are thin beyond that. If something were to happen to one of the Blue Jays’ expected rotation members, Biagini could be considered for the role, depending on the nature of the injury. If Marco Estrada‘s back is a little tight for opening week, it’s unlikely they would disrupt Biagini’s role as a reliever. However, if something more serious were to happen (knock on wood), it could be far more worthwhile to consider. Walker also addressed the starting five of Aaron Sanchez, Estrada, J.A. Happ, Marcus Stroman and Francisco Liriano, and seemed excited about Liriano’s potential with a full season. One sentence in particular jumped out to me. “He can pitch at the back end of the rotation, but he’s certainly not a number 4 or 5 when he’s on”. No sir, he is not. Liriano showed us that down the stretch, as he finished the season with 12.1 scoreless innings in his last two starts. Finally, Walker discussed the upcoming World Baseball classic, and diplomatically answered when asked about he feels about his pitchers participating. “It’s not my favourite thing, but it’s a part of the big leagues now”. “If they’re healthy and able to pitch, we can’t really stand in their way and we really don’t want to”. I have to agreed with Walker. in that “it’s not my favourite thing”. As much as I love watching the Blue Jays players in any format, the fear of injury in a tournament like this always makes me nervous. I can’t imagine how their coaches and agents feel, even if it’s approved by their MLB clubs. We thank you Mr. Walker, and to Sportsnet for facilitating the interview, as we not-so-patiently wait for opening day.